Laboratories of ISU CCEE are utilized by undergraduate and graduate students, researchers, faculty and professional and scientific staff. Each year, our labs host multiple national and international conferences. Cutting-edge technology is utilized in each departmental facility. All five focus areas boast laboratory space within the walls of Town Engineering Building, and researchers enjoy 24-hour access to many resources. Explore our state-of-the-art facilities below, or contact a laboratory manager for more information. Contains equipment to test and develop Superpave (superior performing asphalt pavements), a process for designing and analyzing performance-based mixes. 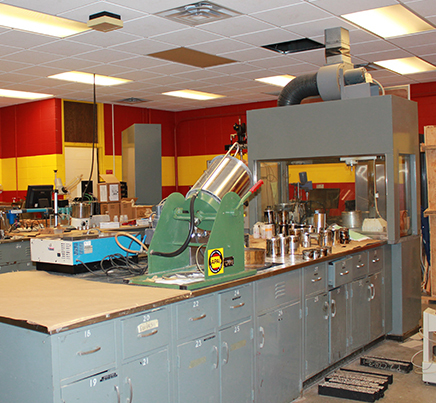 The Advanced Asphalt Materials Laboratory, located in 168 Town Engineering Building, contains equipment to test and develop Superpave. Superpave (superior performing asphalt pavements) is a process for designing and analyzing performance-based mixes. The lab was equipped through donations from the Asphalt Paving Association of Iowa, moneys from Iowa State University, and asphalt contractors and suppliers. Find out more about geotechnical/materials engineering at ISU CCEE. For more information, please contact Paul Ledtje, laboratory manager, at paledtje@iastate.edu. Provides chemical analysis and related training and consultation services. 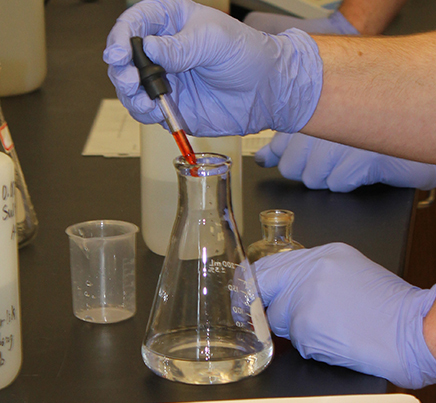 This laboratory provides chemical analysis and related training and consultation services. A Seal Analytical AQ2+ automated discrete analyzer is available for unattended automated analysis of nitrogen, phosphorus, silica, sulfate, chloride and cyanide. A BD-40 block digester is available for simultaneous, semi-automated Kjeldahl nitrogen and total phosphorus digestions. A Leeman Labs Hydra AF Gold Plus automated mercury analyzer is available to analyze for trace levels of mercury. The analyzer uses cold vapor atomic fluorescence with dual stage gold amalgamation and dual detectors. A Varian Saturn 2100 ion trap GC/MS system that includes MS/MS, SIS, and CI capabilities is available. The system includes an autosampler and GC/MS data station. Four gas chromatographs served by EZ Chrom Elite Chromatography Data Systems provide a wide range of options for organic analysis. FID, ECD, TCD, ELCD, PID and NPD detectors are available. Autosamplers are available for liquid injection as well as purge-and-trap sampling. Chromatographs are equipped for operation with packed, capillary or Megabore columns. Sample preparation techniques include continuous or discrete liquid-liquid extraction for water samples and sonication or Soxhlet extraction for soil, tissue and other solid samples. A Shimadzu TOC-Vws TOC Analyzer is available to analyze carbon in liquid samples by the UV-promoted persulfate oxidation method. The laboratory is equipped for most types of wet chemical analysis, including related spectrophotometric and potentiometric methods. Membrane filter techniques are used for bacterial testing. For more information, please contact James Alleman, professor, at jea@iastate.edu or by calling (515) 294-3892. Provides support for advanced soil mechanics testing, including equipment for low-stress, conventional, and stress-path controlled triaxial testing and conventional and automated consolidation testing. Go here to learn about the geotechnical/materials engineering research at Iowa State. For more information, contact Ted Huisman, lab supervisor, at thuisman@iastate.edu or by calling (515) 294-1918. Provides opportunities to study and conduct research related to PCC pavements and supports the State of Iowa’s national leadership role in pavement research innovations. 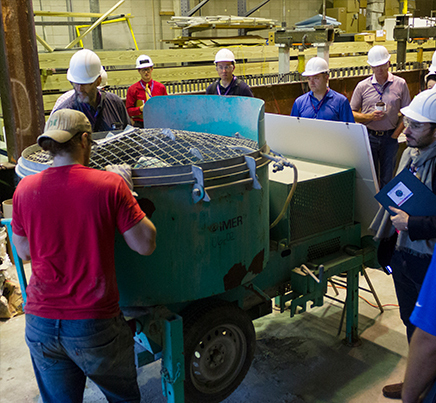 The Portland Cement Concrete Pavement and Materials Research Laboratory (PCC Lab) is funded by the Iowa Concrete Paving Association (ICPA) and Iowa State University. The PCC Lab, housed in 138 Town Engineering Building, provides undergraduate and graduate students with opportunities to study and conduct research related to PCC pavements and supports the State of Iowa’s national leadership role in PCC pavement research innovations. This lab brings together key components of Iowa State’s National Concrete Pavement Technology Center (CP Tech Center) education, research and industry needs. Research focuses on current issues in chemistry, processing microstructure, mechanical property and durability of PCC materials. With the PCC Lab, Iowa State has one of the few university laboratory facilities with an entire PCC research system under one roof. 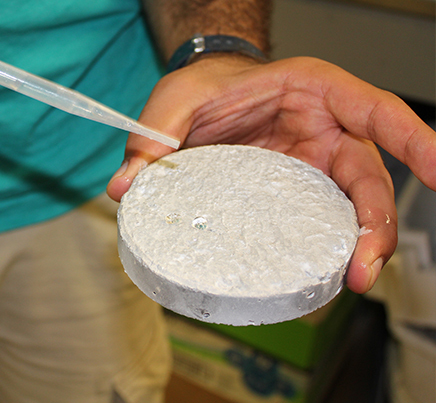 Learn about the geotechnical/materials engineering research at Iowa State. For more information, contact Bob Steffes, laboratory manager, at steffesr@iastate.edu or by calling (515) 294-7323. Used by researchers to test bridge loads and find new methods for making structures safer and cost-efficient. Houses the Livesay Structural Materials Testing Laboratory. In 164 Town, innovative researchers test bridge loads and research new methods for making structures safer and more cost-efficient. 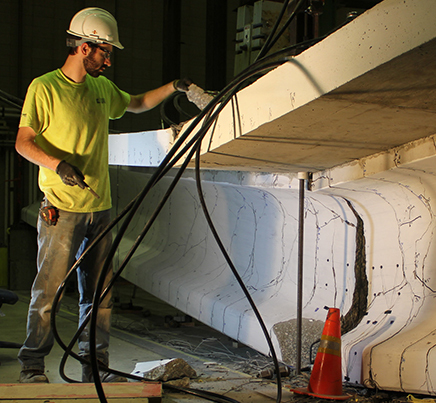 Learn about structural engineering research at Iowa State. For more information, please contact Doug Wood, senior engineering specialist and manager of structural engineering laboratories, at dwoody@iastate.edu or by calling (515) 294-3768. Houses an 80-by-24-foot reaction floor with 300,000-pound-capacity loading points on a three-foot grid. A 15-ton overhead crane accommodates placement of tall loads. The Wallace W. and Julia B. Sanders Structural Laboratory is located in room 130 of Town Engineering Building. With almost as much space as the main testing area (164 Town), this lab is a great asset for structural engineering research at Iowa State University. It has an 80-by-24-foot reaction floor with 300,000-pound-capacity loading points on a three-foot grid. A 15-ton overhead crane accommodates placement of tall loads. Currently, the lab is being used for several corrosion studies and is the work space for the American Society of Civil Engineers Student Chapter Steel Bridge Team. ISU CCEE houses many teaching laboratories within Town Engineering Building. Notable named labs include the Burns & McDonnell Laboratory, the Tom and Ro Jellinger Laboratory and the Joseph C. and Elizabeth A. Anderlik Teaching Laboratory. Read more about various teaching labs by clicking below. When people look at this teaching lab, the first thing that grabs their attention is the open ceiling tiles. Those tiles help teach hands-on construction engineering courses. Students can see the equipment, ductwork, piping and conduit taking up space inside Town Engineering Building. They can also switch out various light fixtures to experience how lighting performance varies. For more information, contact Larry Cormicle, senior lecturer in construction engineering, by emailing cormicle@iastate.edu or by calling (515) 294-8299. On September 25, 2010, the CCEE department dedicated the Thomas and Ro Jellinger Laboratory for the benefit of departmental engineering students. Made possible in part through industry contributions, the lab provides virtual site tours, building information modeling, and a conducive learning environment for senior level design courses. Learn more about the construction engineering research at Iowa State. For more information, contact Charles Jahren, professor-in-charge for the construction engineering program, by emailing cjahren@iastate.edu or by calling (515) 294-3829. Primarily used for CE 453: Highway Design, undergraduate students collaborate on highway design projects using professional software in the Highway Design Laboratory. The laboratory is configured with seven cubicles lining the periphery of the room and a set of work tables in the center of the room to facilitate collaborative team activities on projects. For more information, please contact Peter Savolainen, associate professor of transportation engineering, by emailing pts@iastate.edu or by calling (515) 294-3381. Every civil engineering undergraduate student enrolled at Iowa State is required to take a beginning environmental engineering course in the Joseph C. and Elizabeth A. Anderlik Teaching Laboratory. It also houses several classes for students specializing in environmental engineering. The lab has specialized equipment to analyze air, water and wastewater. 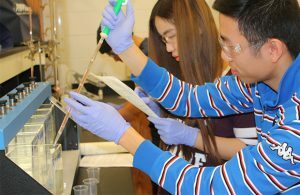 This equipment exposes students to current analytical methods for recognizing and solving environmental problems. Learn about the environmental engineering research at Iowa State. For more information concerning this teaching laboratory, please contact Kendra Lee, laboratory manager, at kmlee@iastate.edu or by calling (515) 294-5639. These laboratories, located in Town Engineering 142, 148 and 160, are utilized by every civil engineering undergraduate student during that student’s time at Iowa State. They host required classes like CE360 and CE382. 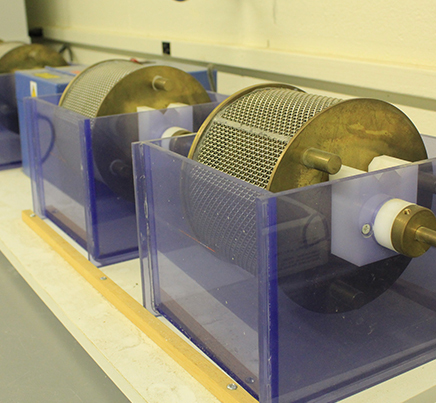 In these laboratories, students can get hands-on experience with geotechnical and asphalt concrete testing equipment. Recent updates to the laboratories provide students with real-world research experience, right here on ISU’s campus. Learn about the geotechnical/materials engineering research at Iowa State. For more information concerning these teaching laboratories, please contact Vern Schaefer, professor of geotechnical/materials engineering, at vern@iastate.edu or by calling (515) 294-9540.